A side dish of fresh and warm garlic cheese bread recipe makes a meal complete. From appetizers to the main meal, garlic cheese bread can be eaten with everything. It is a non-messy dish that can even be served at a children’s party as a finger food, which everybody will enjoy. Here is a tasty garlic cheese bread recipe with spring onions for you to try out at the next party. – Peel the garlic and remove the outer skin. – Finely mince the garlic using a sharp knife. If you don’t like the taste of pieces then you can grind the garlic cloves to make a paste. – Slice the green onions starting from the white part and go up to the dark green part. Slice finely. – Take 1/2 cup of mayonnaise in a bowl and add the sliced green onions to it. – Add 1 cup of grated cheddar cheese, 3/4 cup of Monterey Jack Cheese and 1/2 cup of grated parmesan cheese. – You can add the salt at this stage. – Mix all the ingredients well. – Store this mix in the refrigerator for at least 2 hours before using. This means that you can prepare the mix in advance and then use it later to prepare the bread. – Take the French bread loaf and slice it in half lengthwise, then cut each half in half vertically. – Preheat the oven to 425F. – In the meantime, divide the minced garlic in four equal parts. – Divide the stick of butter in four equal parts. – Place a heavy bottomed skillet on low heat and heat one portion of butter and garlic in it. – Once the garlic is lightly sautéed place one piece of bread white-face down and lightly roast it so that the bread soaks up the butter and the garlic pieces are stuck to it. – Repeat the process for the other three slices of bread. – Make sure that you remove all the garlic pieces form the skillet otherwise the garlic will burn. 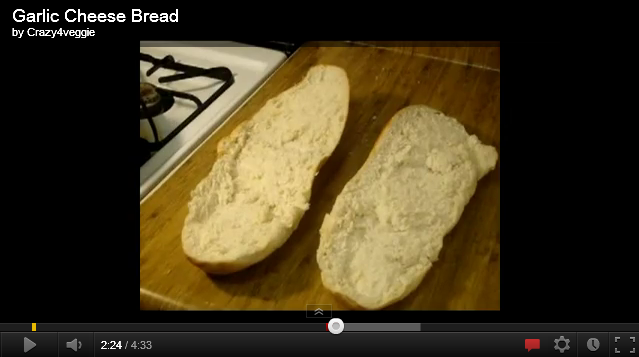 – Place the roasted bread on a baking tray and spread the cheese mixture on the bread pieces. – Bake in the preheated oven for 10 minutes or until the cheese is bubbly. – Cut the slices in thin fingers.